University of Michigan alum Reid Wilson was selected as the first Detroit Data Fellow and will spend the next two years analyzing Detroit Police Department data to help understand crime patterns in real time. Wilson, who earned a master's degree in public policy from U-M's Ford School of Public Policy in 2015, will be joined by as many as four additional fellows as part of the first group. The program is a two-year, full-time, postgraduate fellowship during which participants work with a specific city agency. It's part of a broader universitywide effort to engage with the city, its leaders and residents to create a sustainable impact for a better future. "The main goal of the program is to help Detroit leaders provide the best possible services for city residents," said Brian Jacob, co-director of the Ford School's Education Policy Initiative and a professor of public policy, education policy, economics and education. "In addition, we hope that it will help the university forge stronger relationships with the city of Detroit and provide our graduates an opportunity to give back to the community." The fellowship is designed as an interdisciplinary program open to U-M alumni with a degree in statistics, economics, political science, sociology, public policy, business, engineering, information, urban planning, social work, education or related fields. Fellows participate in a weeklong data analysis boot camp on campus to prepare and each is assigned a U-M faculty mentor. The program builds on the EPI's expertise in data mining and quantitative analysis. Trisha Stein, director of administrative operations for Detroit's police chief, said the fellows will be valuable in the crime intelligence unit, which launched Project Green Light earlier this year in cooperation with a handful of gas station owners to use digital cameras to track crime in real time. The program now has 31 partners in the local business community. "Just coming out of bankruptcy, we didn't have a lot of capacity and investment in infrastructure. Having a relationship with the university is a great way to add to our data capability," Stein said. "The partnership with U-M can make our goals a reality. It's a perfect fit." Under general direction, fellows will analyze large, administrative datasets and perform statistical analyses to assist senior operational and administrative personnel and inform key policy decisions. 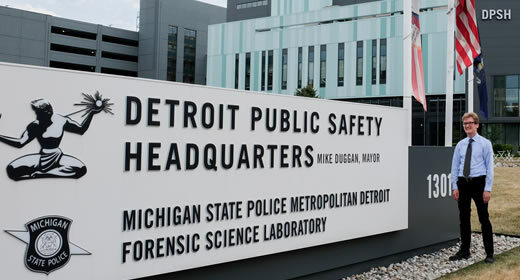 "These are the right tools to have in the Detroit Police Department right now," Stein said. "Being able to track them as part of a mapping system for proactive and reactive crime fighting—that is something we should certainly measure and see what is working." Wilson, who started in the department earlier this summer, said he's starting off by just listening to officers and administrators to understand their data needs. "Through first understanding their goals and trying to help them answer their questions, I can better understand the landscape and how my skills could be used to help them," he said. Some of the program goals include better utilizing data to develop solutions to pressing social problems, expanding the use of data in the city's policy-planning processes and increasing access to data for city personnel and residents. Wilson and future fellows will be embedded in various city departments for two years. The city will pay each fellow a $50,000 stipend per year plus benefits. "I'm excited about the fellowship, because it's an opportunity to refine my research skills and potentially make a real impact within the community through extracting knowledge from data and informing policy," Wilson said. "Plus, it's an exciting time to live in Detroit." --Release by Greta Guest, Michigan News, 734-936-7821, gguest@umich.edu. U-M has a satellite uplink TV studio and an ISDN radio line for interviews.